Could We Find Tomorrow's Water Supply Under the Ocean? Underground boundaries between land and sea aren't as stark as they are to us as we stand on the beach. Water knows this. Groundwater everywhere responds slowly to changes above, even geological changes. In most of the Earth's crust, water moves around a meter per year. This enormous contrast between surface water and groundwater may be the big fact that hydrologists appreciate more than the rest of us, even geologists, who know a lot about slow things. Seawater moving inland is a well-known problem for coastal cities. It arises when groundwater is pumped out faster than it can be replenished, and saltwater moves into the space. In the city of Fremont, the Alameda County Water District successfully manages saltwater intrusion in its major water source, the Niles Cone, by effectively building a wall of freshwater along the outer rim of the cone. The opposite situation, freshwater intrusion, can occur offshore. 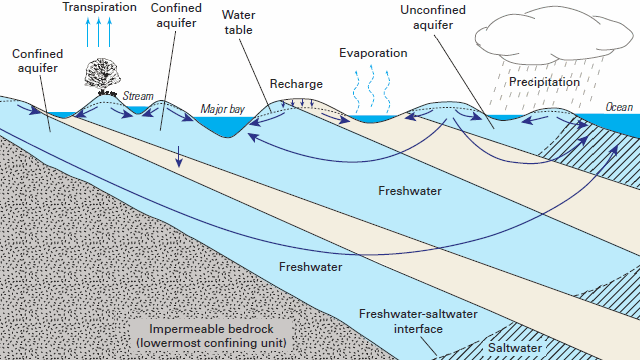 Fresh groundwater lying above sea level on land would have the pressure needed to push aside the denser, salty water of the ocean once it reached that level. And scientists have known for a long time about freshwater springs that occur offshore. In the 1970s, U.S. government geologists learned that fresh water may underlie the seafloor for a surprising distance offshore, up to 100 kilometers in places. Since that time, we've learned a lot more. Offshore freshwater makes sense when we consider the long series of ice ages Earth has been going through for the last 2-1/2 million years. When the glaciers are high, the seas are lowered by as much as 60 meters, which exposes a huge area of land—very fertile land, I should add. For many thousands of years, rains and rivers put fresh water into this ground. Between glacial periods (as we are today), the sea floods in to drown that land, chewing up its soils and forests in the advancing surf. But the groundwater, now offshore, remains fresh because the forces trying to push it out (density differences) are very small compared to the forces that put it in (gravity). The review paper in the December 5 issue of Nature pointed out that offshore fresh groundwater occurs around the world and could be significant for many countries that have short water supplies. Many news outlets treated this as a "discovery," which in science journalism usually means only that reporters (or their editors) hadn't heard of it before. What should Californians make of this news? The answer is that we'll need to support a lot of scientific exploration to learn what's off our coast. The geophysical techniques available are limited in what they can tell us, so we'll need a systematic program of borehole drilling to map out the possibilities. This expensive research has usually been for the benefit of oil and gas producers. It's conceivable that petroleum companies could take an interest in producing water from their offshore leaseholds, though it's pretty unlikely as a widespread strategy. But let's look on the bright side and imagine how it could be. California wouldn't have to deal with the uncertainties of international water law or maritime law, so that's good. Freshwater trapped since the height of the ice age could be pumped ashore and treated for use by cities, which have a strong economic interest in being independent of changes in weather and climate. A prototype that might point this way is being planned by the water supplier for Monterey. California American Water has plans (and money) for a desalination plant that would treat seawater. Its scheme would drill sideways under the seafloor from a land-based rig and pump saltwater from beneath the Monterey Bay National Marine Sanctuary. The agency has applied for a state grant that will get the drilling started late this year. If projects like this could tap fresh or even brackish water from offshore instead of seawater, the costs of desalination would be dramatically lower. Expect to hear about this topic from time to time. But I expect things to proceed at roughly the speed of groundwater itself.